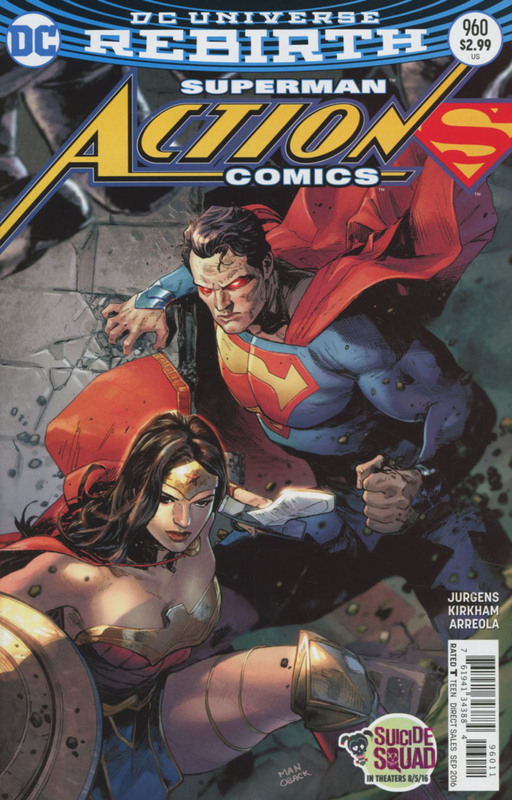 Wonder Woman arrives in Metropolis and saves the very human Clark Kent from Doomsday's attack. Superman rejoins the fight as Jonathan and Lois watch the battle from their farm house. Doomsday eventually leaves Metropolis and once Superman realizes Doomsday might be going after Jonathan he takes off to find his family. He does and after Wonder Woman and Lois are introduced Superman and his wife share a brief moment of peace. That moment is shattered as Doomsday arrives and Wonder Woman moves in to engage the creature in battle. Story - 5: While the storyline continues to barrel along at a good pace and the fight with Doomsday is still very exciting the heart and soul of this issue comes from Wonder Woman. Part of me thinks that the last thing this story needs is a guest appearance from another hero but not only does it make sense from a corporate standpoint (Diana was in BATMAN V SUPERMAN after all) Jurgens does everything right when it comes to her actions and dialogue. The opening scene where she saves Clark has some emotional weight to it considering her relationship with the now dead New 52 Superman. Her initial interaction with Superman was equally as good and I liked how she assumed that the Clark running around was this old/new Superman in disguise. A lesser writer would make their interaction odd for the sake of creating a sense of drama but Jurgens has them getting along right from the jump, glad to see each other and wanting to get right to the matter at hand instead of engaging in pointless "Wow, you look like the guy I loved who died this is so weird" exchanges. The part that made this issue my favorite of the run so far was Diana's brief scene with Lois. It was two pages. Just a handful of panels really but it rang so true to me that I could not stop smiling. Lois points out that it must be weird to see her and Superman together but Diana responds that it's not and that it feels true. This could be seen as Jurgens expressing his feelings on how these characters should get along and how Lois and Superman being together is the natural order of things and to be fair it kind of feels that way. Even if that's the case I really don't care. Seeing Lois and Wonder Woman in a scene together where Lois says that in her reality she was friends with Diana and the New 52 Wonder Woman saying if that's the case they will be friends too made me so happy. I can't even describe how over the moon I was at that moment. This is what I have been missing in my Superman books; characters having a history together and being friends instead of always being annoyed or arguing for little to no dramatic reason. The idea that Doomsday would sense Jonathan and go after him adds another layer to this story and I am all for it. It's not that I want Jonathan to meet a bad end because so far I love this character. Putting him in Doomsday's path is dramatic and raises the stakes for Superman and now Wonder Woman. It's not just about his city or himself. Now his son is in danger and that makes it personal. Again, Jurgens keeps pulling out plot points and character moments that just grab me as a reader and won't let go. It's why ACTION COMICS is my favorite of the current crop of Superman comics. It's not that any of the Superman books that have come out since Rebirth started have been bad. I haven't been this happy with the Superman line in years. ACTION just keeps pressing all of the right buttons for me and once again (I know I am sounding like a broken record here) I get to the end of the issue and I can't wait for the next chapter. Ending on a shot of Doomsday and Wonder Woman fighting was the perfect way to close this chapter out. Is it the second week of August yet? Because I really need it to be the second week of August. Art - 5: The art in this title has yet to let me down. There are panels where Lois or Wonder Woman look a little off but otherwise they and all of the other characters are on model. Kirkham draws great action sequences but, as usual, the quieter moments are where the art shines. The panel towards the end of the issue where Superman and Lois are hugging is one of my favorites. Another great moment was Lois and Wonder Woman talking for the first time. I also liked the page where Superman is hoisting the bus into the air with the sunset in the background. It was right out of BATMAN V SUPERMAN and given Wonder Woman's involvement in the issue that felt right. The final page is just epic and drives home the point that the fight isn't over. Great writing and great art. This is what I have been wanting for a few years now and I am so happy that I am finally getting it. Cover Art - 4: My only problem with this cover is the angry red eyes of anger. I was hoping we would move away from this trope but here it is. Otherwise this is a solid cover. It has echoes of BATMAN V SUPERMAN while actually tying into the contents of the comics. Variant Cover Art - 5: This is a fantastic variant cover. 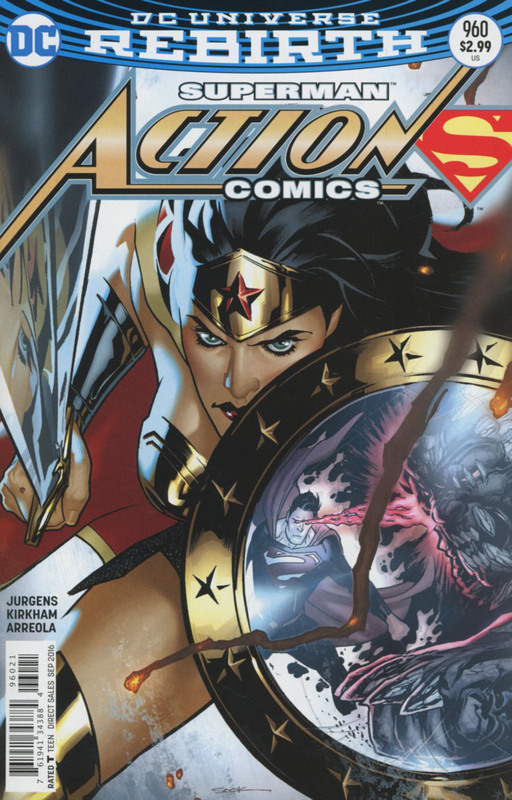 Wonder Woman looks amazing and the reflection of Doomsday and Superman fighting is a nice artistic touch. The variant covers have been top notch on this title and this piece is one of the better covers we've gotten since Rebirth started.